Very Expensive and spoiled women out there nowadays. I am 23 and recently diagnosed with Lupus when i told my friends and family every one of them said you don’t look sick. My response was what am I supposed to look like? a ragged worn out 23 year old! at 23 i feel like i am 80.. i have not had a day where I wasn’t in tears at the end of the night. I get worn out by just walking from my bedrom to the bathroom! I just got started on a medication so hopefully that helps! and our story just made me feel so much better!!! and made me realize that even tho i’m “sick” I don’t have to let me stop me!!! Thanks so much and hope everything is well with you!!! Thanks!! You did such a great job at explaining so many things I have been through! Thanks! I enjoyed your message. I could have written it myself. I get the same comments all the time, but you don’t look like someone who has RA or Lupus. I still have not figured out exactly what someone is supposed to look like. I have RA and Lupus. Let’s make it two: AMEN SISTER! Thank you!!!! I feel so much better about my illness’s (Hashimoto and Adenomyosis). You really put the words I have been searching for out there!!!! Thank you. I was NEVER a high maintenance person until AFTER I got sick. My friends finally get it that the better I look, the worse I feel. Who wants to look in the mirror and see how bad they feel? Most of my family, still do not get it. I thought about showing them the lab results, and trying to explain, but decided it was not worth the effort. I’ve been a spoonie for 25 years, and “high maintenance” has always been my way of being. 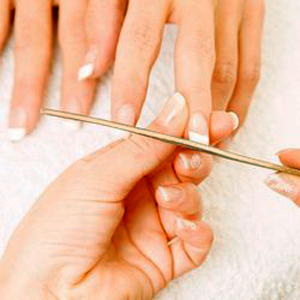 Hair just so, nails….never a chip, perfect tan and pedicure. Ready to roll. Now, if I have the energy to get my hair like I want it, it’s magic. RA keeps me from doing my nails and I don’t want people to look at them, anyway. Lupus…no tanning, but the worst??? Well I saw the wonderful picture of the pedicured feet and began to cry. I had to have my great toe amputated earlier this year–osteomelytis. I am lucky I still have my foot and my husband is so understanding. It’s only a toe and my husband is encouraging me to go for a prosthesis $$$ just to make me feel good about myself. High maintenance? It tires me out, but the thought of painting my toenails again. It’s a confession I long for each night when I put my feet into bed. My husband? He’s a saint…Now if we could just manage that PAIN. Thanks for making me feel “not alone”. Wow…Wow!! I’m newly diagnosed with SLE and you have said it all for me in this article, so happy I found this website. I too am a spoonie. Mine started at the age of 10. And everything you wrote…it’s things I wish I was able to articulately write, and once upon a time, may have been able to be that articulate, but now (chronic fatigue, insomnia, and the medications they have me on all compromise my capacity to (eg…now) articulate well) I am a total mess. Sure, some days I have a limp, some days I walk pretty close to normal, and others, I can barely make it with a cane, and yes, I am a little plump, but that’s no means to judge whether or not you’re sick. I used to work out when I could afford the gym, but there’s such a limit to it when any pressure on your foot places you in agony. Then you have to make a choice: medications or a gym bill. I do miss it though, because it did help me feel better (after a few days of recovery) but it took less and less time. And physio used to be something that offered at least some excercises and machines I wouldn’t have access too to help build up some strength in my knees so I can walk more than a few steps without my knee giving out… I admire your courage and strength, and that you have made it so far. You have every right to pamper yourself; any spoonie does. It doesn’t change the fact every day is a struggle. I have had those comments from family and even my boyfriend has trouble believing that every day is painful, because somedays I am able to puch myself and I just prefer not to complain so I hide it. So, of course, I must be “normal.” This is a struggle all spoonies will face. There needs to be awareness in the gen. public. I wish everyone the best, and for some days of relief! I agree totally with everything you said, I am a guy so I don’t get my nails done (but this article might make me start lol), but I do so many other things for the same reason. But, what made me comment is you comment about having to take a nap, it depresses me enough that I have to lay down, (between my illness’ES and my med’s, and my insomnia), but to have my family complain about how many naps I take, really makes me feel depressed. I will have them read this, and hopefully it will help. Wow! high five the majority of that article however i also teach aerobics and dance classes but currently been beaten and unable to walk or sit without being in pain so really down at the mo that I cant do what I love. also love my nails being done and tan always makes me feel better!! WOW!! I felt like I was reading my life story!! Talk about hitting the nail on the head!! Thanks for sharing!!! I LOVE this article. It sounds so similar to what I do to maintain some semblance of normalcy. I can’t control the side effects of my meds or when I am holding 15 pounds of excess water or when I have a lovely bright red rash BUT I can control things like how I dress (most days, some days it’s dictated by my pain) and making sure my hair is at least clean & combed & well conditioned (I think having thick, curly hair actually helps on this) and no matter what I always keep my hands and feet well taken care of w/ polished tips & toes. These things I have control over and with so much beyond my control, I take pride in the things I can control and maintain. God Bless you for putting into words what I have been feeling for so many years. I have Raynauds, fibro, ? scleroderma.. When your whole life changes because of chronic illness but others tell you “but you don’t look sick” or “just snap out of it” it just made me feel guilty for being sick. Thank you for these words of wisdom. I am a nurse and find that some health care professionals are the least understanding due to lack of knowledge. Now I may direct them to your website so they may be enlightened. I do not have Lupus , but with fibro I hear you. Being a girly girl myself, I look in horror in the mirror each day. I do not recognize myself, sometimes I see glimpses when I work through the pain and apply make up , blow dry the hair and try to make it look better than what you described above. I recently could start getting my nails done again, but the pain it causes to do so often does not get over ridden by the Marylin red I get them painted in. I walk to stay slim as I can, but it hurts so much I wince, making it hard to motivate and of course I get the IF you can walk, why can you not work? I am shell of my former self inside and out and as I try to make myself smile , it fades quickly when I see my teeth with no gums left and soon to fall out and no money to get them replaced. But all I do to hang on to just a little bit of my girly loves is worth it to me cause it is all I really have left of me. Wow, Steph! We get it cuz we got it! I don’t have Lupus, but FMS, asthma, hypothyroid, yada,yada! I am tired of killing myself for ppl who don’t appreciate it. My dishes waited for 3 days to be done, (fibro fog made me forget to buy dish soap) 3 days to do them, (I work fulltime, daugther was carless, extra driving and Christmas parties (3) this week to tend to) and my husband made a comment about how I couldn’t get the dishes done! Forget I got another daughter to doc, watched her kids while there, daughter #2 to college, went to work, cleaned and helped run a class on Sunday, AND the dishes were dirty cuz I freakin cooked too!!! Holy Crap!!! You preach it sister!!! OMGosh-I have found another person who feels just like me. You put into words what we all want to and want to tell others. I was diagnosed with Lupus in 2003 and I tell people that I do not know from day to day how I will feel when I wake up each morning. It’s not what I envisioned my life being like. Like you, I have very energetic boys. They’re older now, and that helps. I loved your inspirational blog. Keep up the great work. Wow! That’s all I can say. You took a bunch od words right out of my mouth. I don’t feel anyone in my family really understands what I am dealing with. You explained it beautifully and I will share it! Thanks Steph!